The debut album, Mitchell Yards, was recorded in seven sessions at Sparta Sound in Eveleth, Minn. The idyllic studio turned out to be a perfect place to lay down some tracks. It is a 13 song CD that offers heartfelt lyrics, strong harmonies and the interplay of acoustic/electric guitar layers that definitely fall into a Wilco/Jayhawks, roots rock genre. However, the lyrics are less impressionistic, and often more willing to tell a specific story. Yet, the story lines remain murky enough to allow for multiple interpretations. The album Mitchell Yards weaves narratives with plenty of local Range color to go around for those that hail from the region. 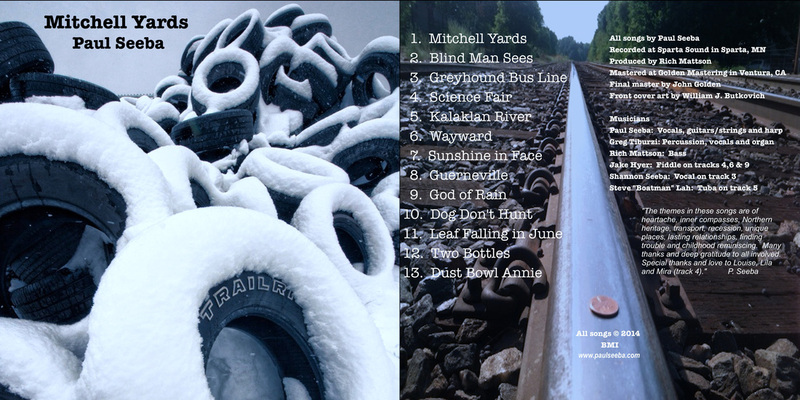 The cover of Mitchell Yards shows old tires that have been abandoned, yet become a thing of beauty when virgin snow is sprinkled upon them. This image sets the tone for the album. The CD takes the forgotten and finds some salvage, recycling the forlorn into something new. The title track is a good example of this idea. A short walk in the woods, one would find the Mitchell Yards as an old abandoned switching station outside of Hibbing, Minn. The yard was slated for the wrecking ball. However, the train station was actually very critical in helping the Allies win WWII and has avoided being razed due to its cultural significance. The song brings this Northern Minnesota history to life without it sounding like a lecture. On one level it is a story about a 9 year old kid, but it has a deeper meaning bringing a narrative from Northern Minnesota to light.